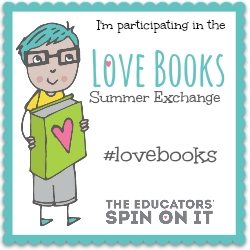 We are so excited to bring you this year’s Love Books summer book exchange! Who is involved in the Summer Book Exchange? Amanda and Kim from The Educators’ Spin On It are the hosts of this summer’s book exchange among 60 bloggers worldwide. They are also the co-hosts of the monthly Virtual Book Club for Kids and Virtual Book Club for Kids Summer Camp. Amanda is the co-author of the fabulous Summer Camp eBook. They bring their experience as moms and former teachers to provide fun, educational, and engaging activities for kids in their mission to parent with purpose. All the participants of the Love Books Exchange were paired up according to the age of our children, our location, and our blog content. I was super excited to be partnered with Growing Book by Book. I love Jodie’s book lists, reading activities, and writing activities. We also loved participating in her Booking Across the USA project this year with over 50 other bloggers. 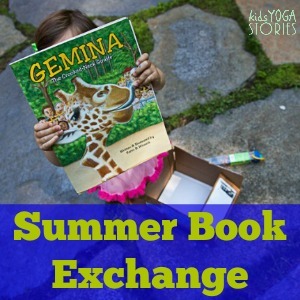 What is involved in the Summer Book Exchange? My active and spirited 3-year-old daughter loves nature, animals, and being outdoors. Using the information about our partners’ children, we put together one book and one book activity, and sent it to our partners. Then, we write about the book exchange package when we receive ours. It’s a super simple activity and such a fun idea to promote literacy during summer. Because she belongs to an expat family, my daughter especially loves receiving packages full of goodies from faraway family members. So when we received our book-exchange package from Jodie of Growing Book by Book, my daughter was ecstatic… a package for her! 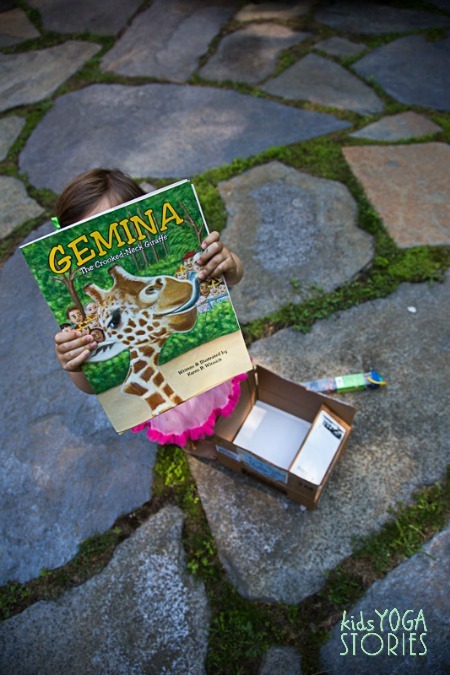 In the box, we found a darling book, Gemina: The Crooked-Neck Giraffe . It is a true story of a crooked-neck giraffe that lived in the Santa Barbara Zoo. The zookeepers never found out what had caused the crooked neck (it developed at the age of three), but it didn’t seem to bother her. The giraffe acted like any other giraffe and wasn’t concerned about her differences. Her friendliness touched the hearts of fans around the world, and she inspired children to feel better about their own differences. 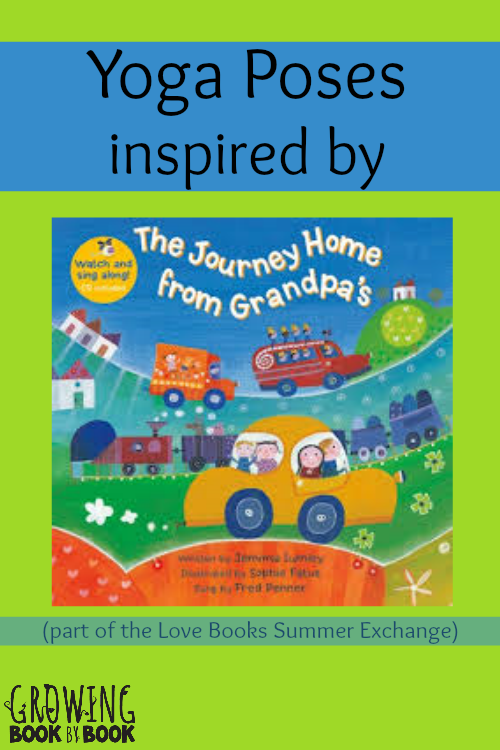 The book is sure to warm your heart and provide a springboard to talk to your child about acceptance, self-esteem, and respect. We also received a Safari Ltd Zoo Babies Toob filled with lots of zoo animals. I’ve taken my daughter to the zoo many times since she was an infant, so she happily played with the animals and called out their names. Jodie included a letter with an introduction to the book-exchange package. 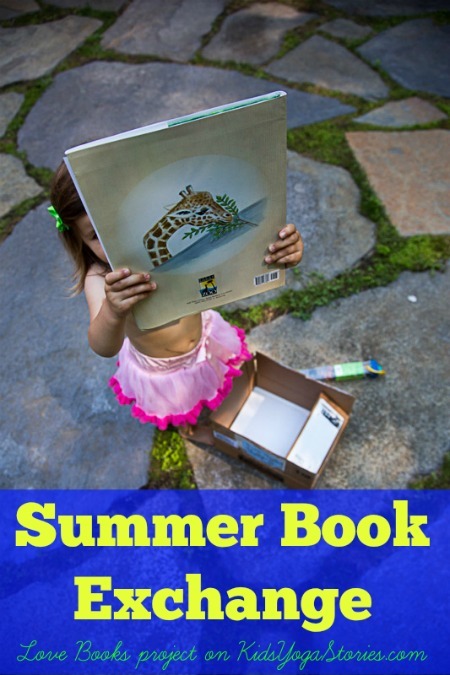 She told us that June was National Zoo and Aquarium Month, so this book was a perfect opportunity to celebrate zoos and the work that they do for animals. Jodie also included a Blank Notebook for us to write our own zoo animal stories. Read through the Gemina book together. Talked about the giraffes that we have seen at various zoos. Did the giraffe yoga pose (Extended Mountain Pose) together and tried to crook our necks to be like Gemina. Looked at the illustrations in our new yoga story, 123 African Safari, and talked about that giraffes live in Africa, along with elephants, lions, gazelles, zebras, and crocodiles, like the ones in her new Zoo Babies Toob. Took out our Zoo Babies figurines and identified the animals. Traced some illustrations of the giraffe image from our new yoga story, and then counted how many giraffes we had traced in our blank notebook. 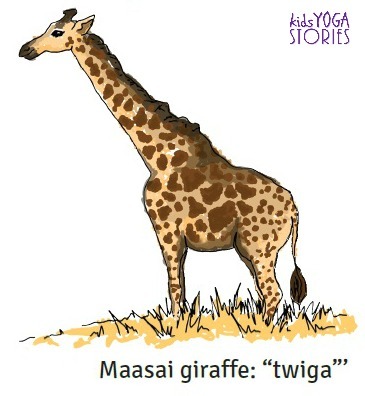 Image of giraffe from 123 African Safari, our next yoga story soon to be released. It was a fun way to integrate reading, movement, drawing, counting, and animal identification—all in a few minutes before dinner. Thank you to Jodie from Growing Book by Book for our fabulous Love Books package! Pick a partner, send each other an age-appropriate book and book activity, and share with us about your experiences. 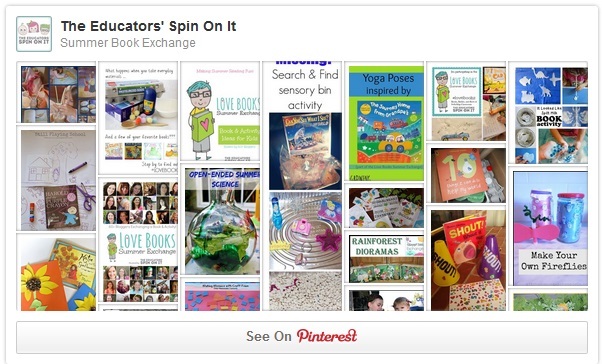 Check out the list of book activities on the Love Book Exchange 2014 Pinterest board for ideas. 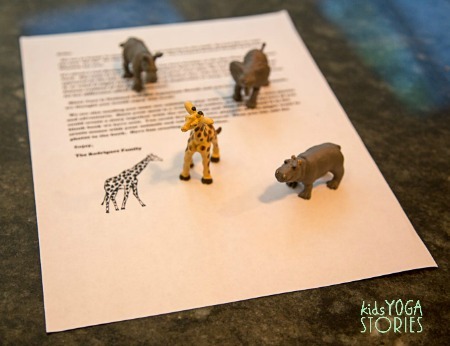 To find out when our next yoga story, 123 African Safari, is released or for kids yoga ideas, sign up for our weekly Kids Yoga Stories newsletter by adding your email address to the subscription box at the top of the page. I so happy that you enjoyed the book and were able to make so many connections with it! Loved being your partner for this fun project! How can you not LOVE giraffes! Thank you so much to you Giselle and Jodie for participating in the #lovebooks Summer Exchange again this year! So fun watching our kids grow and share with books! What a great idea to encourage reading and perhaps even make some lifelong friends! Thanks Barbara – you’re absolutely right! Mini-animals are great for taking along places =) Looks like you had a lot of fun! This book sounds like so much fun, and I love all the activities you did together with it! Thanks for sharing it at Booknificent Thursday! Be sure to check out the giveaway this week!